Romantica, the latest from pop innovators Luna, recently departed from a major label, finds a home on hot indie Jetset Records. Lush, well-rounded pop songs supplemented by enough rock to keep things from being too sugary sweet or too stale, songs like the opener "Lovedust" resonate with you. A silky soft pop gloss lay over a mid-tempo bouncy melody, swimming in the background while the vocals take center stage, firm, but warm and warn, fitting for the type of pop Luna plays. "Weird and Woozy" is cozy, the rhythm section steady and rock solid, the pop flowing down it like a waterfall. "Black Champagne" sits back and lets the melody drive the song, slowing things down to a trickle, flushing things out with strings, creating an orchestrated pop winner. And then there is "Mermaid Eyes," a song that finds female vocalist Britta Phillips singing lead on a good portion, while the band creates a picturesque, eloquent pop backdrop. 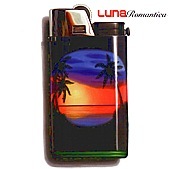 "1995" explodes with the rock, providing Luna can do the other end of the spectrum, as we know they have the pop nailed. A balls-y, loud, straightforward assault of guitars underlined with pop, the band gets you up and moving. Luna's trail of critical praise and influential music expands with Romantica, a sonic album filled with twelve unbelievably delightful pop nuggets. I'll give it an A+.